Discussion in 'General Pokémon Discussion' started by shoz999, Sep 13, 2018. As the thread says. Post your favorite pieces of official artwork, from concept art to posters to promotional artwork! I think official artwork is pretty interesting, showing the mindset behind the artists, showing a ton of history behind the picture, the direction of the Pokemon series etc. Remember now, official artwork. Fan art has it's own section elsewhere. 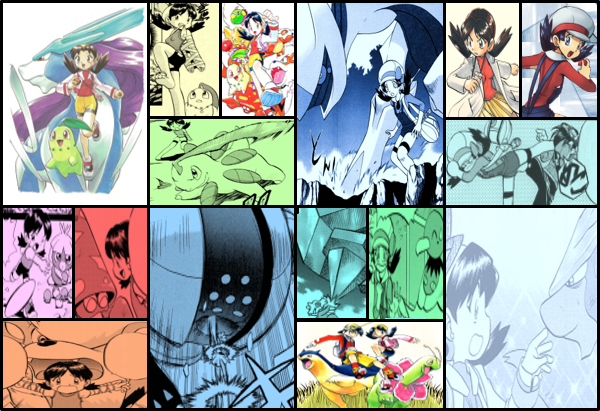 This is the artwork of two of the issues of Pokemon Adventures - Yellow Arc. For the first one that looks like a movie poster, if you read the story and took a look at this artwork, it screams Pokemon Yellow Chapter - "WORLD'S STRONGEST!" like a movie poster! AH MAN! I really want a Pokemon Adventures movie now, I can already envision the epic battle between Mewtwo and Lance of the Elite Four in animation. Also just look at Bill, he feels so out of place, you can tell he doesn't want to be in the middle of the danger lol. As for the second one, I feel it describes the Pokemon world pretty well, even on peaceful days, adventure and Pokemon are just around the corner! I just like how Yellow is peacefully fishing around the Tentacool acting like actual Jellyfish floating above the ocean, Pikachu being the only one who notices the danger below, a giant Tentacruel acting like a sea monster. I don't really see a lot of artwork that says both peaceful and danger at the same time lol.